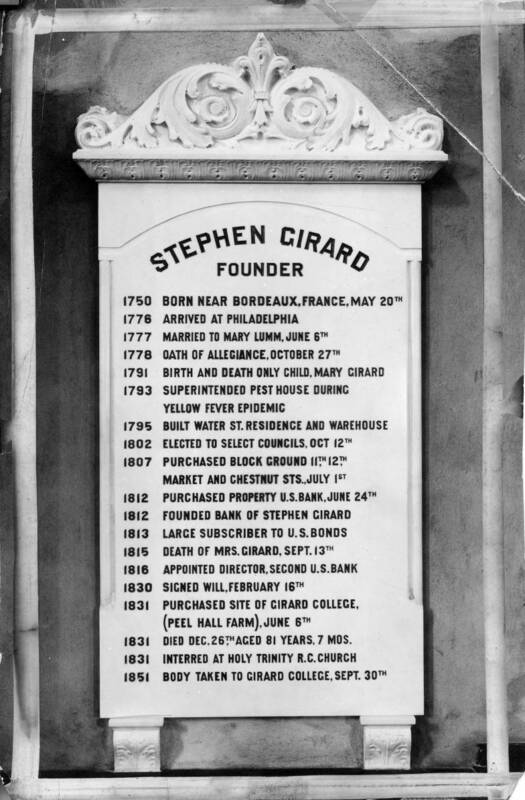 Stephen Girard (1750-1831) was a wealthy merchant, banker, and philanthropist who resided in Philadelphia in the late 18th and early 19th centuries. Born in France in 1750, Girard spent much of his adolescence sailing between various Atlantic ports with his father, a sea captain. Girard’s life as a merchant eventually brought him to the Port of Philadelphia, where he would settle and became a naturalized citizen in 1778. As a citizen of Philadelphia, Stephen Girard continued to work as a successful merchant, maintaining his trade routes across the Atlantic and expanding down to New Orleans. When the Yellow Fever epidemic swept through Philadelphia, Girard funded and supervised a hospital accommodating the poor and very sick. 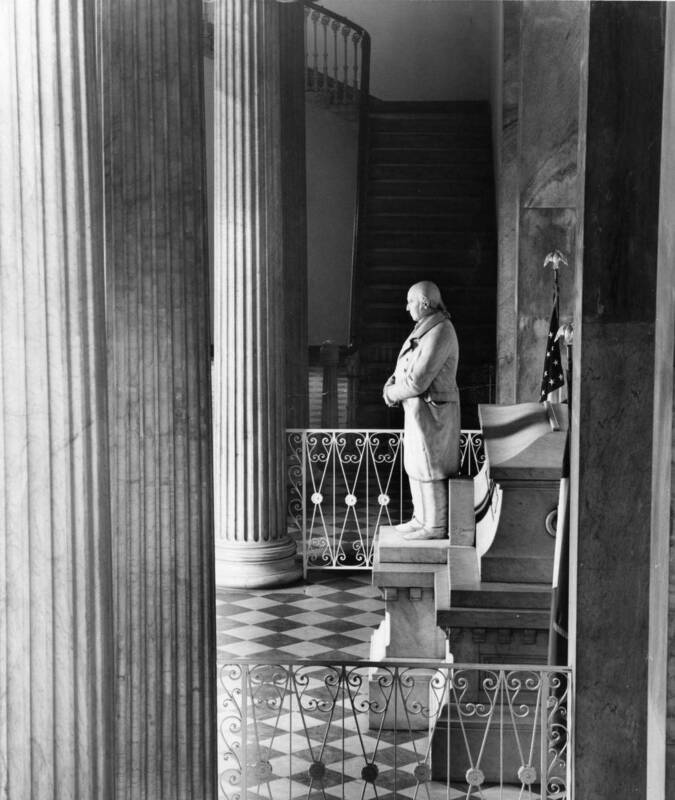 A little over a decade later, Girard purchased the First Bank of the United States in Philadelphia and began his own bank. Girard’s Bank would become the primary financier of the War of 1812. In addition to many business ventures, Girard owned much real estate. While keeping their original home in Mt. Holly N.J., Girard and his wife moved into Philadelphia and began to accumulate land across the city. In South Philadelphia, Girard’s land was famous for the farms and agriculture that he developed. At the time of his death in 1831, Stephen Girard was the richest man in the United States. Since Girard’s death, his will has been at the subject of numerous lawsuits. Unhappy with his extreme philanthropy, Girard’s family contested the will in 1844 in an attempt to re-distribute the wealth and claim a greater inheritance. Prominent nineteenth-century lawyer Daniel Webster argued the case on the family’s behalf. Ultimately, the case was unsuccessful, as the United States Supreme Court ruled against the family’s petition in the landmark ruling Vidal et al vs. Girard’s Executors. The loss was considered humiliating for Webster. In 1954, on the heels of the United States Supreme Court’s landmark decision in Brown vs. Board of Education, Girard’s will was once again challenged in court, this time on the grounds that restricting Girard College to “poor, white males” was unconstitutional. After a lengthy court battle and civil rights demonstrations, Girard College was successfully integrated in 1968 and, in 1984, began to admit female students as well. 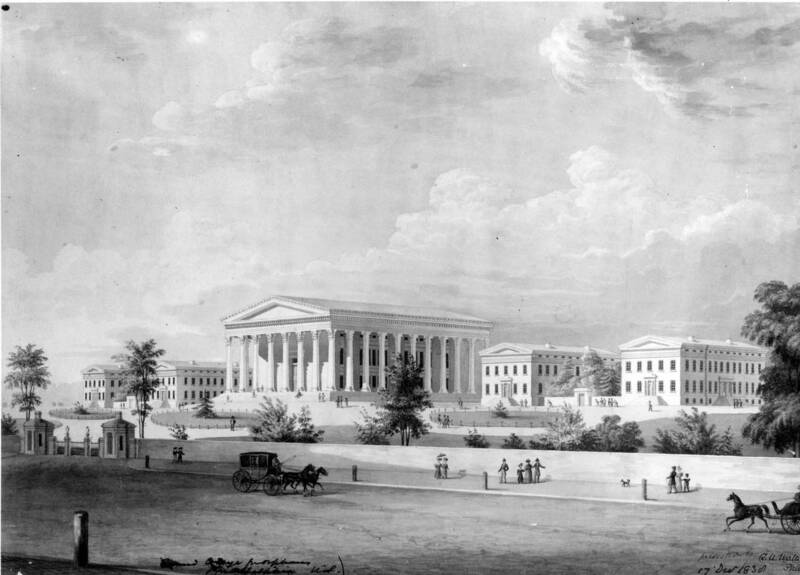 A century and a half after Stephen Girard’s death, the creation of Girard College remains one of the largest acts of philanthropy in the history of the United States. To view primary source materials about Stephen Girard and other topics in Philadelphia's civil rights history, search our collections.